Wizards Storage Portal was upgraded on April 29. Over the last year, we have been working on the next generation of the Status-page – or DASHBOARD as it’s called now. Many users were asking for better sharing, ability to save Widget layouts and an easy way to switch between several dashboards. All this has been implemented now + a couple of other enhancements. The new design is tab-based, and allows you to create as many dashboards as you want. 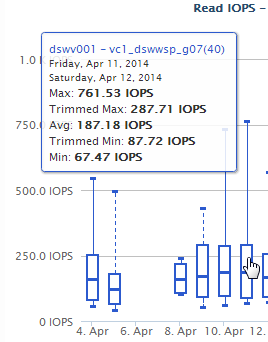 This is useful for building themed dashboards with a large amount of widgets. 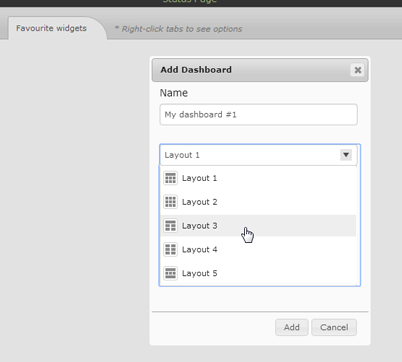 When you create a new dashboard, you can now choose the layout template that suits your needs best. When you are satisfied with the content of your dashboard and the widgets it contains, you can save the Dashboard to the Dashboard Repository. 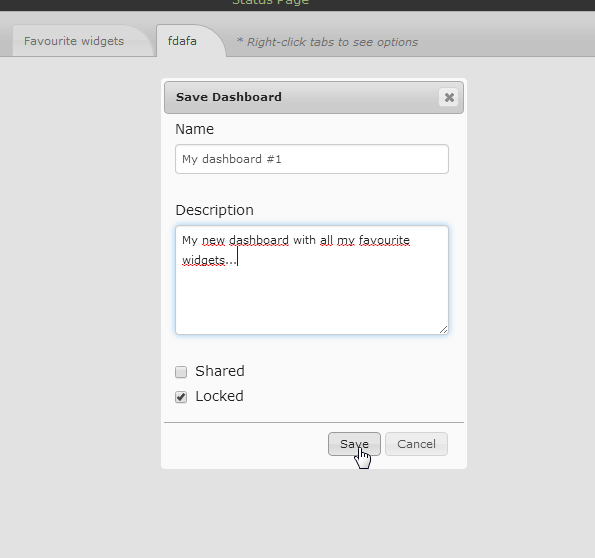 Add a description to it and choose whether you want the Dashboard to be shared, locked or both. Shared: Lets you share your dashboards with your colleagues. Locked: Restricts the editing so only the owner is allowed to edit or delete the dashboard. To open the Dashboard repository, simply click the “folder” icon in the upper right corner. The Dashboard repository cntains all the Dashboards you have saved as well as all the Dashboards other people have shared with you. 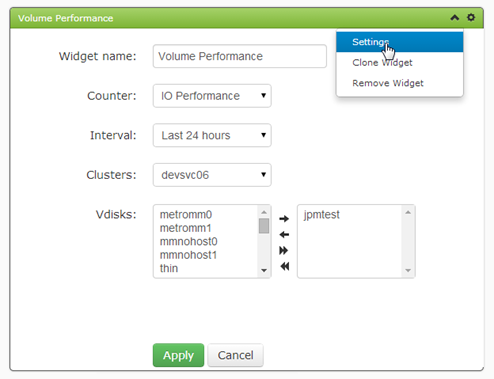 When you select a dashboard in the Repository you will see a number of options: Properties, Duplicate, Open and Delete. With the new Dashboard you can add widgets by rightclicking the tab of the Dashboard you wish to add a widget to. 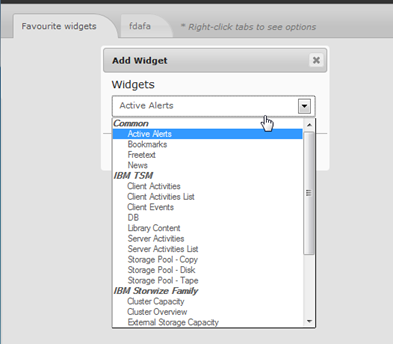 When you click Add Widget you will get a dropdown list with all available widgets organized by Product Family. Drag Widgets from one tab to another..
All widgets can be dragged and dropped to another position on the dashboard, but they can also be dragged and dropped from one dashboard to another. Simply grab the widget that you wish to move and drop it on the tab of the dashboard you would like to move it to. Another new feature is the ability to customize the name of the individual widgets. The new charts offer new chart types, iphone/iPad compability and much better performance. The new charts have advanced zooming functionality, which allows you to select a region with your mouse and the chart will instantly zoom in on the selected region. 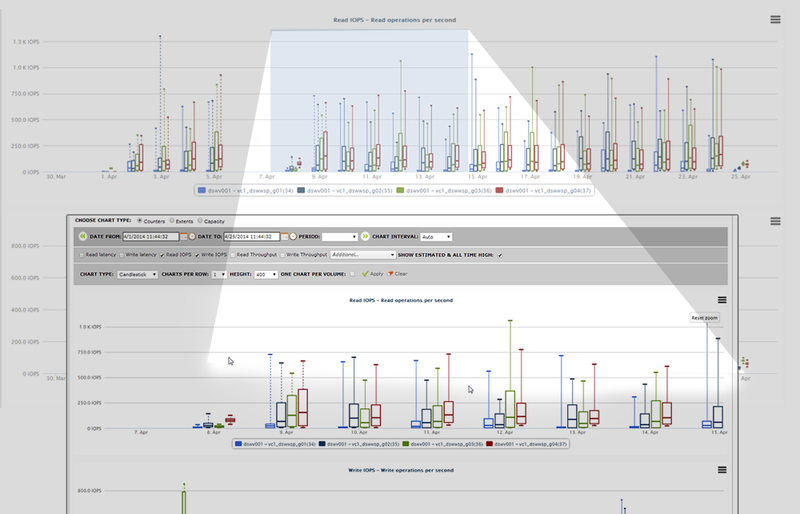 It can be very tricky to produce meaningful visualizations of workload, especially when looking at very large datasets. Candle-stick charts was invented by Manuhisa Homma back in the 18th century for showing stock-market activities. Each candle-stick represented an entire day or week, and gave an instant view of High, Low, Open and Close stock price. And by using color coding, it was also possible to show the trend. The “trimmed” value(the body of the candle) is the amount of workload that has been present for at least 80% of the time, so it depicts the “normal” workload, whereas the MAX value could be an abnormal behavior that does not say anything about the sustained workload.